Campaigners are calling on the government to ban the sale of glitter because it contains micro plastics that can harm marine life. 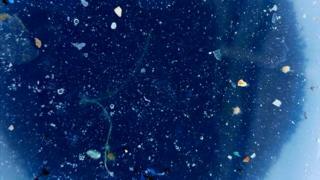 They're pointing to a recent study that revealed up to a third of fish caught in the North Sea contained micro plastic particles - including glitter. We want to hear what you think - have a read of this article and let us know in the comments below. The castle made out of plastic bottles! David Innes, one of those behind the petition, said: "Glitter might look lovely but, because it's plastic, it sticks around long after the sparkle has gone - often in the stomachs of fish and birds." Glitter was banned at a chain of nurseries in Dorset back in 2017 after they learned of its effect on the environment, and it's use has also stopped on BBC show Strictly Come Dancing and some music festivals. Why is glitter a problem? Standard glitter is made from etched aluminium bonded to polyethylene terephthalate - a form of microplastic that can find its way into the oceans. It can pose a danger to people and animals. But Mr Innes says, "the British public is clear; supermarkets should be moving faster to tackle plastic waste". Trewin Restorick of the environmental campaign group Hubbub agrees, saying: "It falls to retailers to support their customers to reduce their use of single-use plastics and, while we all need a little sparkle in our lives, glitter, which is known to be harmful to the environment, must surely be one of the easiest plastics to cut out." Mr Restorick says: "It's understandable that supermarkets have long lead times on seasonal items, so they should be looking now at what they can do to bring forward long-term pledges on glitter." Last year we asked you if you thought glitter should be banned - 76% voted No, while 24% voted Yes. Where can you find biodegradable glitter? "A lot of people think that the glitter wouldn't be as durable because it's biodegradable," he said. "It feels softer because there aren't harsh plastics used in the process but its not like it will melt off your face at a festival," he added. ALDI - it plans to scrap plastic glitter from this year's Halloween range. 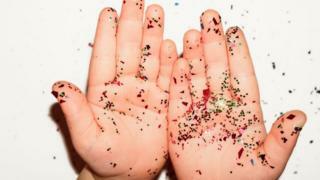 Its part of a pledge to remove non-biodegradable glitter from all products by the end of 2020, it said. WAITROSE - it's pledged to remove glitter from all its own-brand lines by the end of 2020, with a focus on its Christmas lines. MARKS & SPENCER - it's been trialling using a biodegradable glitter - Deco Bioglitter - on gift bags, and is now going to start using it on flowers and plants too. LUSH (Beauty care shop) - it is using a plastic-free sparkle, made from synthetic fluorphlogopite dazzle to its bath bombs, shower gels and cosmetics. Sophie Awdry set up a company called Eco Glitter Fun - a biodegradable cosmetic-grade glitter sold in plastic-free packaging. She says: "Unfortunately, until large retailers switch all glitter products from plastic to biodegradable, consumers will continue to be confused and unsure of what to buy." 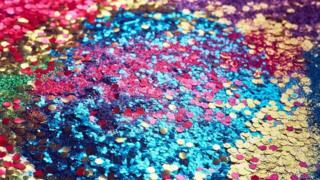 Biodegradable glitter is more expensive than plastic, however, once it is mainstream, the cost will reduce." Retailer Hobbycraft has also launched biodegradable alternatives, including a craft bio-glitter for children's use. "We take our position as a responsible retailer seriously and we are always looking to source more sustainable ways for our customers to craft," said a spokesperson. 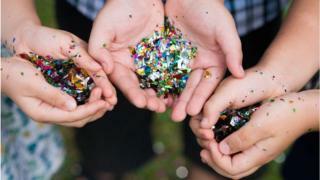 "Our aim is to be completely free of non-biodegradable glitter by 2023." If glitter''s getting banned, I bet fairies will be getting thrown out the country very soon. I think glitter should be banned because otherwise it's affecting the oceans and animals in them. I like glitter, but I don't want it to hurt any animals or our planet. Like if you agree !